A benchtop is one of the most integral elements to any stunning kitchen. With the ability to completely revamp and revitalize your space, the visual appeal of the benchtop material is a matter for great consideration. This is the surface where many of your kitchen activities will take place - whether for your morning coffee, food preparation, daily dining or even simply for decorative aesthetics. For those looking to renovate their kitchen or finding a new home, beauty and practicality both need careful attention. In the name of reliability, one also needs to trust the source of this material – and QN Designs Kitchens and Floorings chooses Essastone® by Laminex benchtops among its leading suppliers of stone products. From Laminex®, Australia’s market leading group in decorative surfaces, Essastone engineered stones that are of the finest quality and with the elegance of a sophisticated Italian gallery. It is no coincidence; these materials are supplied through sources located across Europe, with the latest releases from Spain, Germany and Italy. With its European supply-scale as an authentic and dependable source, Essastone delivers consistency and value; a result of exceptional product and labour quality surpassing European safety and labour standards. As a result, within the engineered material one will find stone that consists of an amazing 95% quartz, plus all the stain-free, scratch-resistant, impact-friendly and citrus acid-resistant features included within a 15-year material warranty. Essastone combines the classic flare of their European sources with modern beauty. If you’re in need of inspirational colour schemes, take a look in Laminex’s online inspiration galleries which feature Essastone benchtops among Laminex decors in cabinets, splashbacks and panels. These provide great scope for planning renovations. These range from the earthy serenity of their ‘Natural’ colour schemes, to the vogue darkness of their ‘Noir’ selections. It doesn’t stop there; Essastone continues to expand their product range every year and their latest 2018 collection is testament to that. Available from October this year, one can find sprinkles of subtle stars upon a dark universe with their ’Lava Black,’ or find creamy elegance among the varying degrees of white veining within their Premium range of marble-look stone finishes. You can always obtain free expert décor advice through Laminex’s interior design consultants at their Osborne Park showroom. Alternatively, QN Designs and its team of certified kitchen designers can be found at the QN Designs showroom at 1914 Beach Road Malaga. There, you can view our large-scale designs and kitchen layouts alongside the Essastone benchtops range. For Essastone benchtops, there is an allowance for tremendous design flexibility as most of the Essastone selections are available in a jumbo range, reducing the need for multiple slabs required in each kitchen project. All these remarkable traits Essastone offers constitute reasons for which QN Designs and its customer base have been loyal to its products for over ten years. Check out the transformations some of our most recent clients’ kitchens have undergone. At QN Designs Kitchens, our clients Gavin and Jo decided to convert from moss-greens and pale wood to a lavish, glimmering engineered stone benchtop to complement dark cabinets and appliances, bringing out a classy contemporary theme to the room. The ‘Unique Calacatta’ selection features a smooth, snow-white base with quiet grey veins streaking across its, used to great effect on the kitchen island and counters. 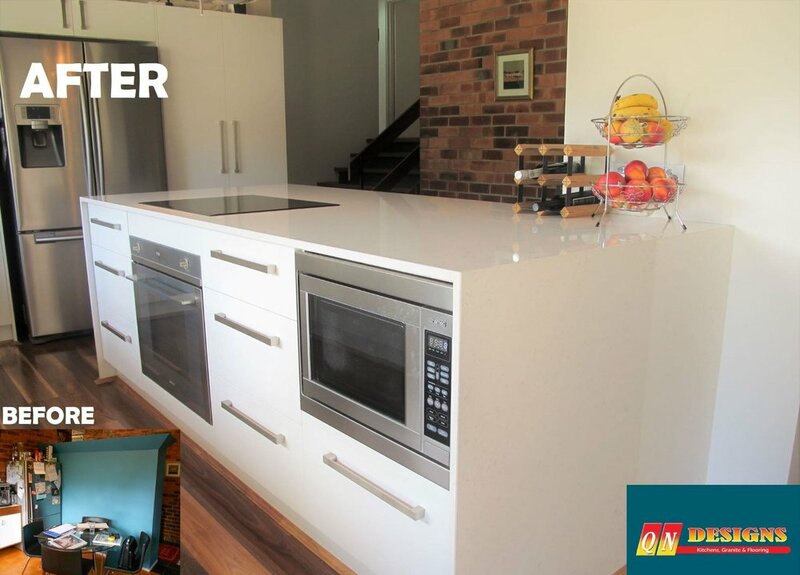 Another completed project was the home of Tim and Victoria, who opted for a white benchtop with their gloss-finish ‘Carrara’. With soft and subtle flecks to pattern the surface, the benchtop also runs down the sides of the end drawers as well as the island to provide an ultimate finish. The results don’t just shine bright in these cases; Essastone benchtops bring continued excellence to any kitchen time and time again. If you’re thinking about a change or seeking a way to enhance your home, consider a European touch through Essastone, from a trusted Australian brand.